Lake has receded a bit lately so there's more shore fishing available however, a boat is best to access entire lake. Silver is receiving Big Fish almost every other week now and seeing plenty of quality 2 to 4 pounders and up brought in.Chelsea from Ojai grabbed a 3-8 Rainbow with power bait using a "Barbie Pole" no less.Everett from Murrieta hauled in a 7-11 Bow in a float tube with a fly rod dragging a Matuka. 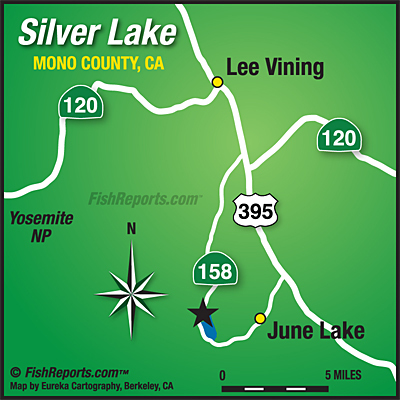 That's the biggest recorded fish caught in The Loop recently.When visiting Silver Lake stop in at the Resort Cafe for the best breakfast around.